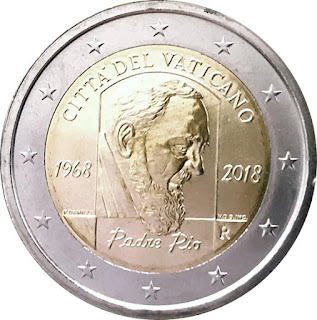 I have just received from the Ufficio Filatelico e Numismatico Vaticano the official information regarding the second commemorative 2 euro coin issued in 2018 alluding to the «50th Anniversary of the death of Padre Pio», an Italian Catholic priest and friar. The currency will be issued officially on October 4. 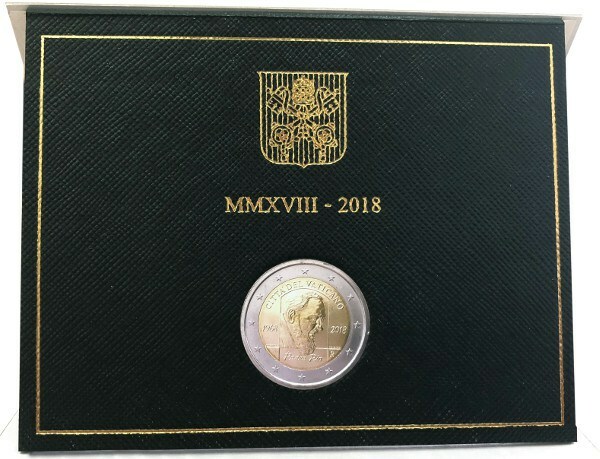 As usual, the currency will be offered for sale in two qualities, BU and Proof, at the price, for subscribers, of 18 and 37 euros respectively, plus the corresponding shipping costs. 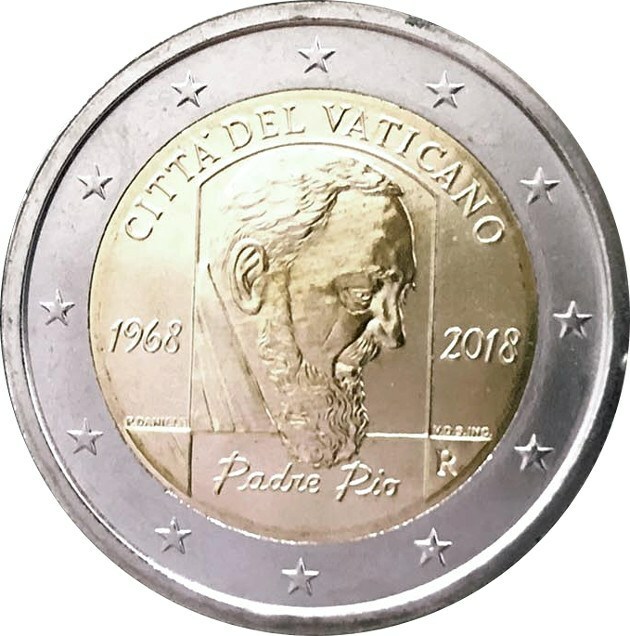 The coin shows the face of Padre Pio looking to the right, under the name by which he was known «Padre Pio», to the left and right the years «1968 - 2108», above and in a semicircle the name of the issuing country «CITTÁ DEL VATICAN". 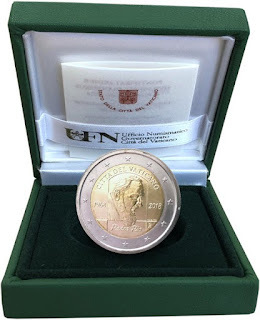 The mint mark "R" and the names of the artists Patrizio Daniele as a sculptor and Valerio de Seta as engraver complete the composition. 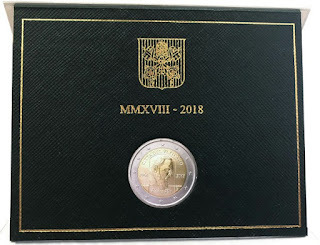 Until completing the 101,000 units of issue volume of this currency, the so-called Busta (philatelic-numismatic set that includes one of these coins in BU quality) will be issued later . 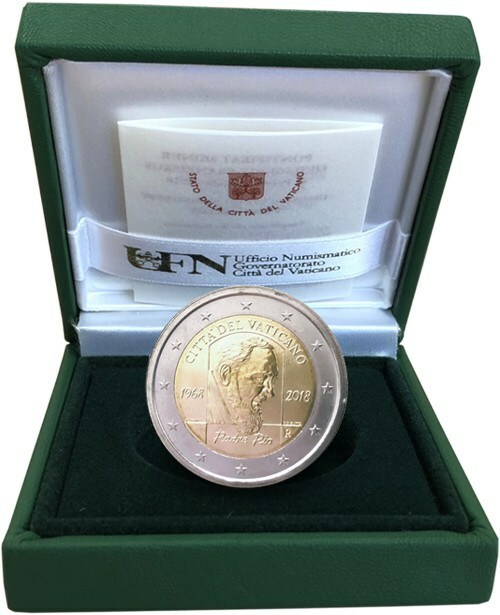 Product that will be offered to philatelic subscribers.